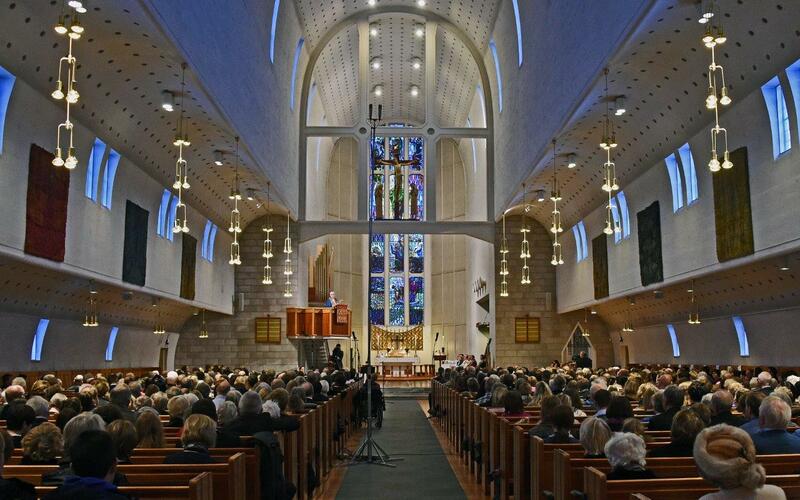 The Church of Norway has represented the main expression of religious belief in Norway for a thousand years. It has belonged to the Evangelical Lutheran branch of the Christian church since the 16th century, and has been a state church since then until 2012. Around 73 per cent of Norway’s population are currently baptized members. The Christian faith came to Norway in the 9th century. It was brought to western Norway by missionaries from the British Isles, and to eastern Norway by missionaries from Germany and Friesland, by way of Denmark. The missionaries were monks, Vikings who had been converted to Christianity abroad, and bishops accompanying their kings. Norwegian kings played an important part in the country’s Christianization, and political interests were an undeniable part of their endeavor, along with the spiritual interests. King Olav Haraldsson, and his death at the Battle of Stiklestad (north of Nidaros, now Trondheim) in 1030, played a significant role toward uniting the nation in the Christian faith. Despite his harsh methods of conversion, his death came to be seen as decisive in turning Norsemen away from their old beliefs. Supernatural events surrounding Olav's death and burial soon led to his being declared a saint, and throughout the Middle Ages St. Olav's shrine on the high altar of Nidaros Cathedral was an important goal for pilgrims from all over Northern Europe. In 1103 the first archbishopric for Scandinavia was established in Lund in southern Sweden. In 1153 the archbishopric of Nidaros was established by Cardinal Nicholas Brakespeare, not long before his election as Pope Adrian IV. By the end of the 12th century the Christian church was firmly established in Norway, as in the other Nordic countries. The Archbishopric of Nidaros included present-day Norway, parts of present-day Sweden, Iceland, Greenland, Orkney, the Faroes, the Shetland Islands, the Hebrides and the Isle of Man. St. Olav's life and death are commemorated in Trondheim and at Stiklestad on 29 July (Olav's Day) each year. His body is believed to rest somewhere under the floor of Nidaros Cathedral, which has been Lutheran since 1537. The Reformation came to Norway mainly as a result of the conversion of King Christian III of Denmark-Norway, following the example of many of the North German princes. In 1537 he established the Evangelical-Lutheran faith as the official religion of Norway and Denmark. The ideas of the Renaissance and Reformation had at this time only reached a very small segment of Norwegian society. The Lutheran Reformation had been initiated some decades earlier by Martin Luther, the German reformer. The King's decision was based on political as well as personal grounds. A central political reason was his need to reinforce the already existing union between Denmark and Norway. The Archbishop of Nidaros at the time, Olav Engelbrektsson, who had become a spokesman for national independence, fled the country in April 1537. His flight marked a turning point in Norwegian church history, and reinforced Norway's political dependency on Denmark. Of the three other Norwegian bishops at the time two were imprisoned, while one chose to become Lutheran superintendent (later, the office reverted to bishop). The majority of priests gradually conformed to the new situation, performing their pastoral duties according to the new ritual and doctrine. Monasteries and convents were dissolved. Apart from a few cases of violence, when individuals refused to abandon their religious customs, the transition was peaceful. A central part of the new confession was a simpler liturgy, more concentration on the preaching of the Christian message in the vernacular, in this case to a large degree Danish, and the singing of hymns. Religious symbols, ways of thinking and customs of Roman Catholic origin were forbidden. By 1600 Lutheranism was formally established, and had taken over the church structure of the whole country. In the course of the 17th century the change was carried out at the popular level. However, in some areas people continued to express their belief in more or less Roman Catholic terms until the 19th century. From the early 18th century on, Pietism – the individually oriented Lutheran revival movement which emerged in Germany around 1670 – had a profound impact on Norwegian church life. The movement reached the country in the 1730’s, faded around 1750 and gained a more permanent foothold through the Pietist-inspired Evangelical revival movements of the 19th century. During Pietism's first spell in Norway the Lutheran confirmation was introduced (1736), Bishop Erik Pontoppidan's explanations of Christian faith were published (1737) and the state school system was established (1739). They were all central instruments of Christian education. As in other parts of Northern Europe, Pietism developed in parallel to the general secularisation of society, caused by the ideas of the Enlightenment and democratisation. One of the main initiators of the second phase of Norwegian Pietism was Hans Nielsen Hauge, a late 18th- century farmer's son who claimed that everyone had the right to preach the Gospel. According to current Norwegian law, this was restricted to ordained Church of Norway clergy, who were also civil servants. Nineteenth-century Pietism thus combined opposition to the clergy, who were considered to be too lukewarm in their attitude, with democratic protest against the ruling class, which included the clergy. Out of Hauge's efforts grew the present pattern of autonomous Church organisations for domestic and foreign mission. Since the 1850’s they have represented a strong encouragement to personal commitment in faith and service, in church and society. The northern, partly Sami, areas of the country, were strongly influenced by the revivalist teaching of the Swedish pastor Lars L. Læstadius. Although more ascetic, this branch of Pietism has largely remained less anti-clerical than its southern counterpart. In a certain sense, the Church of Norway was a “state church” since the Reformation in 1537, when King Christian III of Denmark-Norway assumed leadership of the Church. Still, the designation fits best for the constitutional form of the church after 1660, following the introduction of absolute monarchy. The Norwegian Constitution of 1814 confirmed that the Norwegian state would retain “the Evangelical Lutheran religion” as the official state religion. The 1814 Constitution embodied the principal democratic ideals, and initiated a process of church reform. In the first decades after 1814 the principal church issues were lay preaching and freedom of religious expression. Around 1850 the focus shifted to the need for structural changes within the Church itself. Seeing little hope of sufficient church reforms, certain groups decided to leave the state church. The majority, however, were encouraged when the Parliament supported a proposal to establish a certain degree of parish democracy. Parish synods, with limited influence, were introduced in 1873. This development initiated a movement in favour of greater democracy within the formal structures of the Church. Unofficial diocesan synods were formed, and sent representatives to biennial national assemblies from 1873 to 1982. Thus there were two movements for church reform: a slow official one and a more impatient unofficial one, but there were many links between the two. The major church reform of the 20th century has been the legal establishment of parish councils (1920), diocesan councils (1933), the National Council (1969), diocesan synods (1984) and the General Synod (1984). The Bishops' Conference, which had been an official body since 1934, also received legal status in 1984. The Norwegian Institute for Interchurch Relations, established in 1951, was replaced by the new Council on Ecumenical and International Relations in 1971. Firstly it was organized under the Bishops’ Conference and from 1984 established as a council directly under the Church of Norway Synod. A Church of Norway doctrinal commission was established in 1987. Since 1989 parish pastors, who had been appointed by the King since 1660, have once again been appointed by church bodies: the diocesan councils. On 21 May 2012, the Norwegian Parliament passed a constitutional amendment that granted the Church of Norway increased autonomy. In the new wording of the Constitution there is no longer reference to an "official religion of the State." Article 2 in the Constitution now says that Norway's values are based on its Christian and humanist heritage. This loosens historical ties between institutions of State and the majority Lutheran Church. Following the constitutional amendment, a new Church Law is currently being developed. In parallel, the formal link between the public school system and the church has been weakened. The Church of Norway has therefore intensified its efforts in Christian education. Recent decades have also seen reforms in liturgical practices.